Brazilian cow hide rugs are by far the most superior cow hide rugs in the world and are suitable as highly fashionable cowhide rugs, wall hangings, throws or upholstery material. Select chromium tanned Brazilian cow hide rugs are hand selected from various premium sources to guarantee quality, beauty and lush softness of pile. Natural Brazilian cowhide rugs are now a very popular home decor item, and associated with classic Western and Southwestern decor. But we have exotic African animal print cow hide rugs as well as solid color dyed cow hide rugs, acid wash and other exotic renditions of cow hide rugs. 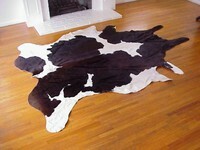 Brazilian cow hide rugs are easy care and stand up to heavy traffic. 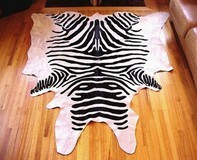 Browse our amazing collections of beautiful and exotic natural, animal print and solid color dyed Brazilian cow hide rugs. Enjoy the possibilities.